Thomas K. North Platte, NE. "I've been using the SteerStopper for a couple of weeks now and I love it. It is exactly what I was looking for. It works great for fixing my wheel when I have my front rack loaded and need to put my daughter in the child seat. It makes my life so much easier. Thanks for inventing it, and thanks for your help to find the right one for my bike." "The SteerStopper is an excellent and very well made accessory to help me park, move, and work on my Cruzbike, which otherwise has a floppy front end." "We are on our 4th day of a 1-month tour in the Netherlands and we love our SteerStopper! 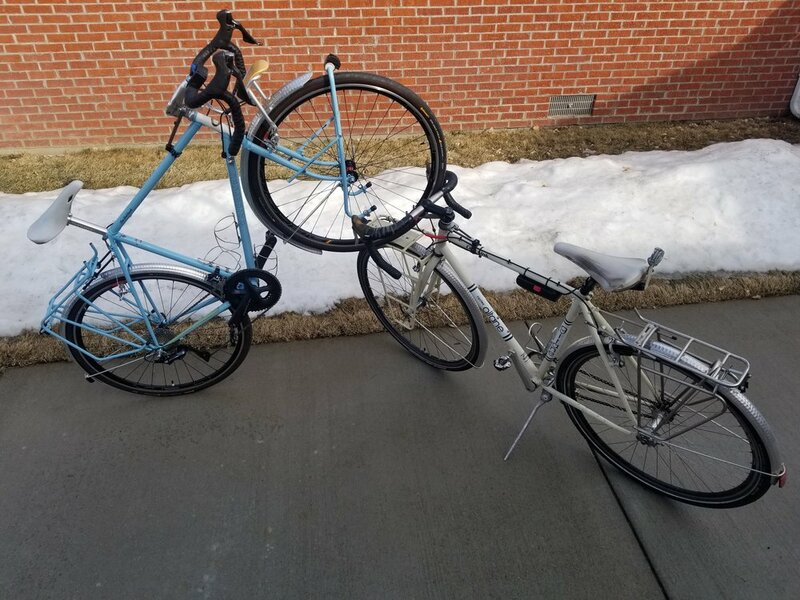 It is so easy to use, we can securely lean our fully loaded tandem against any stationary object. Thank you for your great customer service in helping me get a good fit on my odd diameter tubing." "Thanks for a great product! I did a two-day ride up/around Lake Quinault in preparation for my 7-day ride on the Great Divide route with my daughter last week. Many people admired the Steer Stopper and it really worked well for me." "An absolutely essential addition to my touring bike." Prentice S. Santa Cruz, CA. "My wife and I received SteerStoppers as a wedding present, since our "honeymoon" was a bike ride across the country together. At first, we had no idea what it was or what benefit it would serve our trip, but we installed it anyways. It ended being- by far - the most used and useful tool we brought on the ride. It saved us from numerous falls and inconveniences. For anyone doing a bike tour, this is 100% a needed item. It is made with the most high-quality design and materials. We love the SteerStopper!" Harmony P. San Mateo, CA. "The Steerstopper has been a remarkable addition to my Easy Racer recumbent. Now it’s easy to find a place to rest my bike, and it never tips over anymore." Ned H. Sullivan's Island, SC. "The SteerStopper is the bike accessory I never knew I needed. Hours into my recent bike tour I realized it's much more than a convenient add-on, it's an essential tool in my everyday gear kit. Its quality never faltered in my two-month tour." Jen R. San Mateo, CA. "So pleased the steerstopper now on new bike, nightmare without it. Fell over three times on last trip (before SteerStopper installed) because so temperamental when parking with panniers". "I really appreciate the steer stopper. So much easier now to park my bike. Worth the cost." "I'm glad to know that I'm the first SteerStopper cyclist in Europe. It surprises me a little bit, because your invention is honestly ingenius. During a bicycle trip in Normandie (France), I was thinking a very long time about this problem of tilting the front wheel. I was surprise that nobody came up with this invention. I was using a strap to block my front wheel. But anyway, I found the professional solution now." my thoughts. I recommended it to my touring buddy, too." 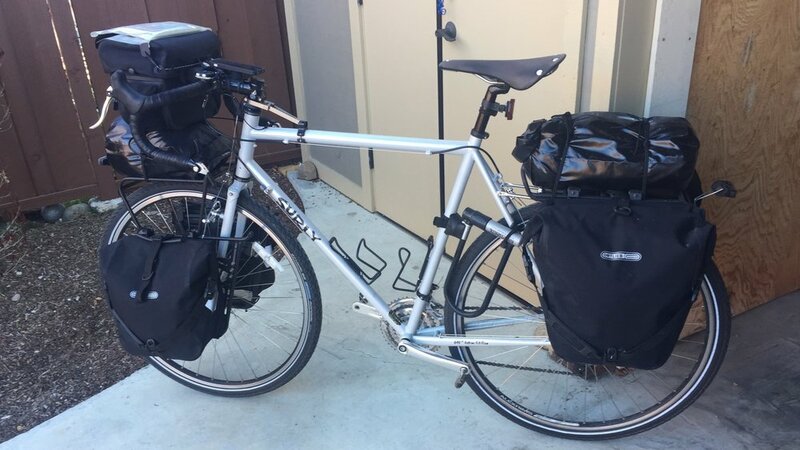 "I have done extensive self-supported bicycle travel on this Miyata 1000 that I built. While in remote places I have struggled to find a good lean against an odd array of objects. I am so pleased that my elegant Steer Stopper makes those once awkward moments now effortless"
"I received the Steer Stopper as a gift. At first look, I thought, yeah it's nice and it's very well engineered, but what real use will I get from it? I installed it on my touring bike and headed out on an 18-day adventure. I found that the Steer Stopper went from a device that I thought I'd never really have much use for, to a device which became an indispensable addition to my bicycle. The Steer Stopper made stops along the route easier. Every time I stopped, I'd engage the Steer Stopper and I could lean my bike without fear of it falling over. It was really handy for brief stops to read my maps too. Awesome job!" Ken D. Camano Island, WA. "My workplace does not provide a decent bike rack, so I park against this sign. Without the SteerStopper, the wheel would regularly flop and the bike would end up on its side. It was not only an annoyance, but was also scraping the paint. I am so thankful to not have to deal with that anymore. The other great thing about the SteerStopper is to use it while straddling the bike for any period of time, such as stopping to get something out of the handlebar bag, taking a photo, admiring the view, etc." Joe M. St. Cloud, MN. "Great device! I am amazed this has not been standard on touring bikes forever! Glad you thought of it!" "It seems so obvious. Even little things like loading bikes onto a rack. I wish I had a nickel for every time I got whacked in the head by the bars. Or just putting the bike on a work stand." "Sensational!!!!! I have been hoping for 30 years that someone would invent this kind of product. Congratulations and thank you very much, my next bike trips will be more enjoyable!" "I bought one for my wife as a gift and it works well, so now I'm getting one."